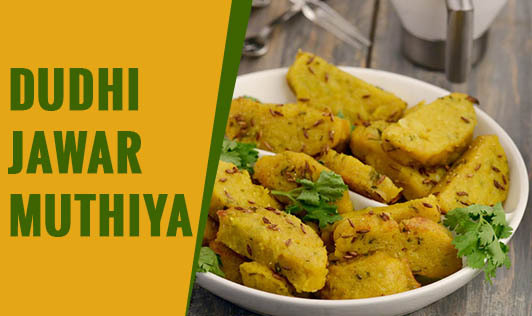 Dudhi Jawar Muthiya is a flavorful, healthy, and fiber-rich dish that can be served as a farsaan at mealtime or can be had as a healthy snack at tea time. Curry Leaves- 3 to 4 nos. 1. Mix all the ingredients together in a bowl and knead together to make a soft dough. 2. Make 4 cylindrical rolls of approx 5" length. 3. Keep the rolls on a greased thali and steam them for 10 to 12 minutes or until done. 4. Prick the roll with a tooth pick to check if it is cooked all the way through. The tooth pick should come out clean. 5. Cool the rolls and cut them into small pieces. 6. Now heat oil in a deep pan and add the cumin seeds. 7. When the cumin seeds splutter, add hing and curry leaves. 8. Finally add the sliced muthiyas and sauté till they turn slightly brown. 9. Garnish with coriander and serve hot with chutney.